Do you want to see Ratchet & Clank before it hits theaters? Click here and enter your information into the Google Doc for your chance to win a family four-pack of passes for a special advance screening being held on Saturday, April 23 at 10AM in Salt Lake City. Entry deadline will be Thursday, April 21 and winners will be notified before noon on Friday, April 22. Good luck and we’ll see you there! 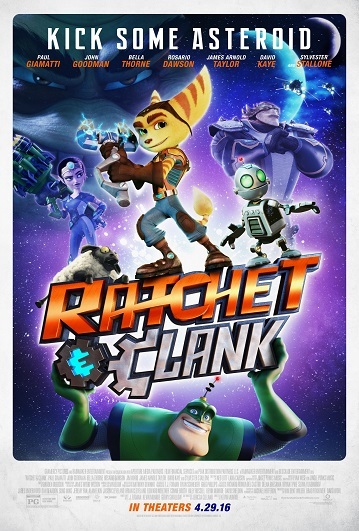 Synopsis: Ratchet is the last of his kind, a foolhardy lombax who grew up without a family. Clank is a pint-sized robot with more brains than brawn. After stumbling upon a weapon that can destroy entire planets, they join forces with a team of do-gooders known as the Galactic Rangers. Together, they must stop the evil alien Chairman Drek from utilizing this dangerous technology. Along the way, Ratchet and Clank learn valuable lessons about heroism, friendship and discovering one’s own identity. Ratchet & Clank opens in Salt Lake City on April 29.